This graphic novel will keep you quivering with fear! Halloween has always been a night of tricks and treats, but this year, it’s nothing but a cornucopia of tricks as werewolves, demons, killers and zombies celebrate the festival of Samhain! Interestingly enough, I still have still not got around to checking out the 2009 film which this 4-issue series is an adaptation of, and to which a sequel has recently been announced, but I do enjoy this comic-book. Published the DC Comics imprint Wildstorm, and written by Marc Andreyko, based on the script by Michael Dougherty, with different artists drawing each chapter, this series takes place on Halloween night in the same small town. It’s sort of like an anthology, telling different stories of what people are up to this night. Each stories initially appears to be unconnected, but Dougherty cleverly manages to connect them as the series goes on. I’ll try to avoid giving away any major spoilers, because each story is chock-full of clever twists and cliffhangers that you’ll want to read for yourself (assuming YOU haven’t already seen the movie). In CHAPTER TWO, Grant Bond is the artist. A group of kids in costumes are going around collecting Jack O Lanterns, and take them to an old abandoned Rock Quarry, where one of them tells the “urban legend” about how many years ago, a school bus full of 8 special needs children was deliberately driven into a mud pit, and then never heard from again. Among the group is Rhonda, a girl with special needs herself, and when she hears the voices of those dead children, she thinks the other kids she came with are just playing a trick on her. OR ARE THEY?!? 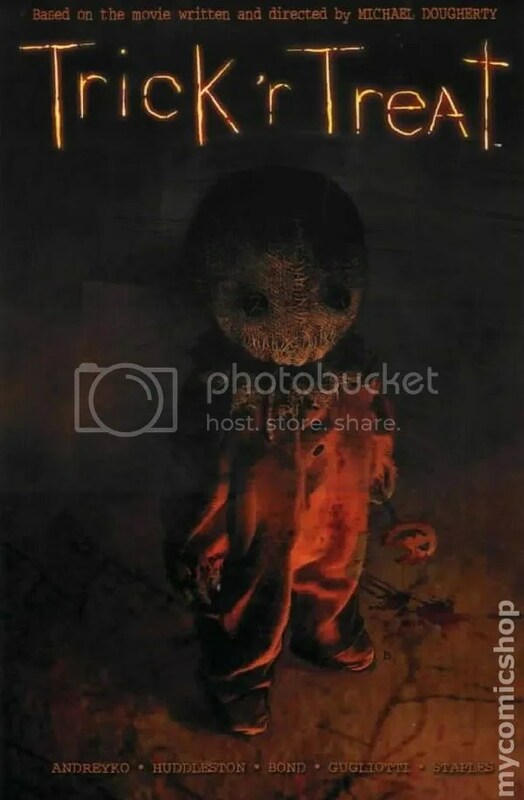 And in CHAPTER FOUR, drawn by Fiona Staples, a grumpy old man finds himself terrorized in his own by a young pyscho in a scarecrow costume (that would be SAM, the young lad on the cover), who really, REALLY wants some candy. Each story is chilling, worthy of being a classic Twilight Zone episode. And the artists are all capable and do a fine job. Dougherty himself provides some additional artwork in the comic, as does Breehn Burns and “Ragnar” This comic is so good it’s probably why I haven’t felt a rush to see the film, because reading it is already just as good as a watching movie. I recommend this with a Chacebook rating of FIVE STARS.